Up here in the North the cold and darkness have firmly set in. The days now start in the dark and by 2pm the light is beginning to fade. Thick coats and gloves are a necessity. To counter this gloominess the Swedes have lamps on all their window ledges to softly brighten up their houses. In Advent the atmosphere is especially cosy with candles and illuminated red or white paper stars hanging at the windows, fires roaring in wood stoves and much drinking of mulled wine, here called glögg (from glödga “to heat, to mull”). Mulled wine is a tradition that goes back to the Middle Ages. Spices and heat enhance the warming effect of alcohol and improve a poor wine’s drinkability. Red wine is usually used for mulled wine and the traditional spices are cinnamon and cloves. Mulled wine – Glühwein in German and vin chaud in French – is enjoyed during the Christmas and New Year festivities but also whenever the weather calls for a hot, sweet, alcoholic beverage. In the mountains, on the slopes, it is the perfect drink to thaw out frozen fingers and toes, and to relax with. It is equally pleasant to drink during the winter in a town café or bistrot as an alternative to tea. In cafés, in France and Switzerland, vin chaud tends to be hot wine (watered down) served with a sachet of sugar and a tea bag containing spices. Mulled wine is usually prepared in the home. Recipes vary but most will contain any of the following: citrus fruit (chunks of orange, orange or lemon peel), cloves, star anise, cinnamon, cloves, pepper, vanilla, nutmeg, cardamon, ginger. (See below for some mulled wine recipes). 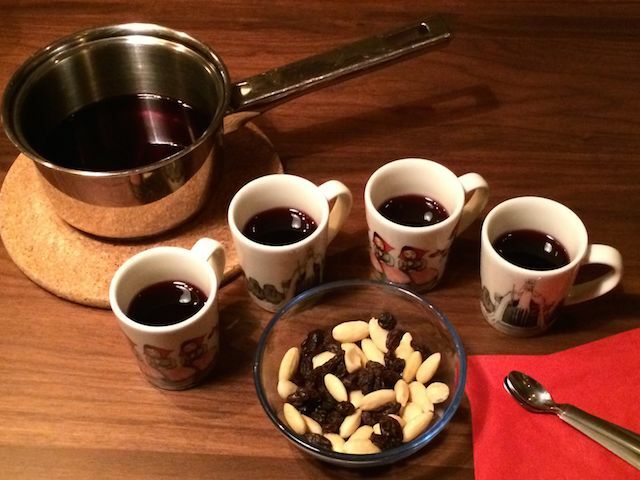 In Sweden, the tradition for drinking mulled wine is generally limited to Advent and so stops at Christmas. If some prepare their own glögg at home, many buy ready-made ones direct from the shop. According to a recipe from the 19th century traditional Swedish glögg is made from ordinary red wine and is seasoned with mace, cinnamon and cloves. Commercial glögg, however, comes in all sorts of different colours, sweetness and alcohol content. The latter varies from none at all, alcohol free, essentially spicy fruit juice, to low alcohol, to 10% for regular glögg (vinglögg) and around 15% for stronger glögg (starkvinsglögg). Some are made more alcoholic by the addition of spirits. The appearance ranges from pale straw to golden toffee and various shades of plum red depending on whether white wine, red wine, cider or fruit juice is used as the base. The different levels of sweetness and flavourings cater for most sugar fiends. On the store shelf traditional glögg lies next to bottles that have had rum or whisky added to them, and next to more exotically flavoured ones such as chocolate and vanilla, mint and chocolate, chilli and chocolate, or figs and port wine. I caught up with Sören Sörensen, master blender at Galatea Spirits AB, to get some insider information on the mulled wine market. With a turnover in 2011 of 700 mio SEK, Galatea is a major importer of beer, wine, cider and spirits in Sweden and the biggest importer of beer in Scandinavia. Its other activities include distribution and production. 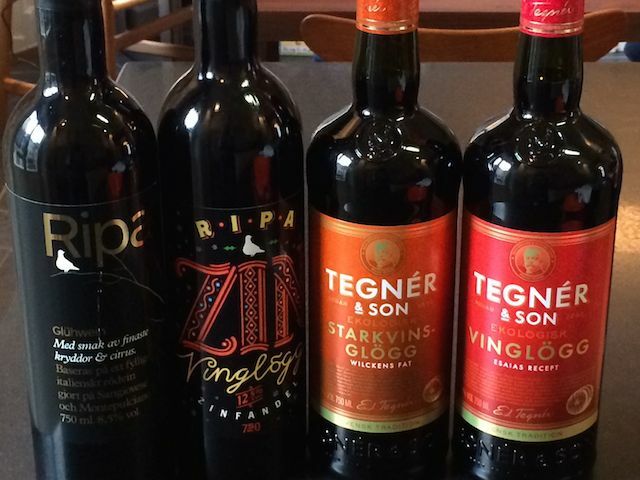 Glögg is a drink Galatea make themselves under their own Swedish brands Ripa and Tegnér & Son. Whilst Ripa caters for a younger, more adventurous consumer, Tegnér & Son produces traditional beverages including a brandy which was awarded a silver medal by the IWSC in 2012. The jovial Swede greeted me in his offices with a member of the Tegnér family. SJ. Why do you think that in Sweden it is so popular to buy ready-made glögg rather than make it yourself ? Sören Sörensen. Possibly because Sweden as a whole has come to wine fairly recently and is not a wine producing country. There is, however, an old tradition here of drinking glögg. We have pictures in our archives dating from the end of the 19th-early 20th century of the wine cellars belonging to the wine merchants Tegnér & Wilcken. On one of the photos you can see a big wooden barrel with “Glögg” in white lettering. SJ. Is glögg a Christmas tradition only ? S. Sörensen. Glögg is drunk mainly in the build-up to Christmas with most of the sales taking place during the last 2 weeks of December. We would of course like to see the season extend but shelf space is only available at Systembolaget for glögg from the 1st of November until the end of January. SJ. Is glögg only drunk in Sweden ? S. Sörensen. We make it for the Swedes and also export to Finland. SJ. The Swedish population is not huge (approx. 9.56 mio), the glögg season is very short, how many bottles are actually sold each year ? S. Sörensen. Approximately 3.5 – 4 mio litres of alcoholic glögg, which is 5 mio bottles representing a value of roughly 350 mio SEK including tax. SJ. Your brands are up against quite a number of competitors including Blossa, Dufvenkrooks, Saturnus, Morberg and Goder Aftonglögg to name a few. S. Sörensen. The biggest competitor is Blossa, with 75% of market share. The remaining 25% is split between all the other glögg brands. SJ. Blossa has a strong appeal, with a wide choice of glöggs. It also launches a new flavour and an attractive new bottle design every year. How are the glöggs that you are producing matching up to your competitors ? S. Sörensen. We are focusing on producing quality products. We make sure that all the wine that is used for our glögg is of high quality and that it comes from reputable producers. Furthermore, all of our glögg is certified organic. Today, this is a strong selling point. We work with classic grape varieties, such as Zinfandel/Primitivo or Sangiovese. These varieties are well recognized and enjoyed in Sweden. We do not use colouring agents and we keep the sugar content 25% lower than our competitors do (at 175 g per litre for Tegnér & Son and Ripa Zin glögg). We also price our products a fraction below our main competitors. SJ. You currently have 3 glöggs on the shelves at Systembolaget: Tegnér & Son Vinglögg, Tegnér & Son Starkvinsglögg and Ripa Zin. These brands are fairly recent, how did these glöggs come about ? S. Sörensen. I have always prepared my own glögg at home, in a dryer German style. In 2011 I devised 8 different glögg blends for Galatea. The samples were submitted to Systembolaget and they accepted not 2 or 3 but all 8 of them! The blends were then made up commercially, bottled and launched in time for the festive season. Our glöggs have proven to be popular and in 2013 our sales were so good that our Tegnér & Son Vinglögg and Tegnér & Son Starkvinsglögg qualified for inclusion in this year’s range at Systembolaget. SJ. So what is next ? S. Sörensen. Our Tegnér & Son traditional glöggs will always make up 2 thirds of our glögg sales. This leaves me with the freedom to come up with some interesting and fun flavours for our Ripa brand! Sören Sörensen already has plenty of ideas for blends involving traditional berries. I will say no more… I look forward to winter 2015.